The country’s second city, Bergen, surrounded like Rome by seven hills, or mountains in this case, is on the west coast of the country. Blessed with a large harbour, it was part of the Hanseatic League in the Middle Ages and has large cruise ships and three-masted sailing ships visiting on a regular basis. On a previous visit we stayed at the Thon Hotel Rosenkrantz, which is just behind Bryggen, the famous harbour frontage, and was reasonably priced, central and comfortable, but this time as we were attending a party to celebrate a 60th and a 50th birthday, he Irish and she Norwegian, we stayed in Paradis, one of the suburbs. Our accommodation this time was the Bergen City Apartment Paradis, about 3.5mi from the city centre. It is a self-contained ground floor apartment attached to a house, complete with kitchenette and two single beds pushed together to make a double. It cost £401 for three nights, reasonable by Norwegian standards and very quiet apart from a little traffic first thing on Monday morning. Friends tell me many home-owners in Bergen are building annexes to rent out or sell, so this is a good source of reasonably priced accommodation. The Bergen Light Railway (Bybanen) runs from the airport into the city centre and there is a stop at Paradis, about 10 minutes walk from the apartment. We paid 74 Norwegian krone (NOK) – about £6.20 – for a single trip for two. Tickets are valid for 90min and journey time was about 20min from the airport; it's also 20min from Paradis to the city centre. A short distance from the apartment is a cycle track used by both cyclists and walkers. A 20min walk on a lovely sunny evening brought us to Troldhaugen, Edvard Grieg’s former house. Entry costs NOK100 (£9.20) per adult including admission to the museum, house and garden. Grieg’s composing hut overlooks a lake in the garden where he and his wife, Nina, are buried in the side of a cliff. There is also a concert hall with regular performances. Returning to the apartment along the cycle track we saw two people swaying out of sync toward us in brightly coloured clothes. Only when they came closer did we realise they were cross-country skiers practising on short skis with eight wheels attached – an unexpected but somehow truly Norwegian sight. On Saturday we travelled into Bergen to the tourist information centre right on the harbour edge to book the 3.5hr “Norway in a Nutshell” fjord trip for the next day. It costs NOK550 (just over £50) per adult and took us to Mostraumen and back. At one point a high-speed ferry approached the fjord wall and a crew member collected water from a waterfall which was offered to the passengers – tasted good. The water is so clean I once saw a starfish on the bottom of Bergen harbour. There is also a trip available to Voss and Flåm which we had done on a previous visit, but it takes a lot longer. We had lunch in the Bergen fish market on Saturday, open sandwiches of wild salmon and crayfish tails at NOK45 (£4.15) each. I am a freelance photographer for the restaurant and food pages for Hertfordshire Life magazine and for pub and restaurant social media sites, so I spent a while photographing the fish and food for stock images … whale and dried cod are subjects you wouldn’t see in England. After lunch we took the funicular railway to the top of Mount Fløyen, cost NOK149 (£13.75) return per adult. There were long queues but the service runs until 22:00, so later is better. The summit provides a fantastic view over Bergen and there is a café and gift shops, pricey as evidenced by £6.90 for two ice creams. There is also a children’s play area, which surprised me as the surface was stones not bark, but I was told Norwegian children are tough. There is also a forest school on the mountain and walking trails at the top – not to mention a wooden sculpture area of various trolls, all very strange. The evening was spent celebrating the birthdays of our friends, one of whom brews his own, something that has become a popular pastime for Norwegians and ex-pats. One reason might be you cannot buy alcohol from a supermarket on a Sunday, so stock up on Saturday if you want to drink in the accommodation. 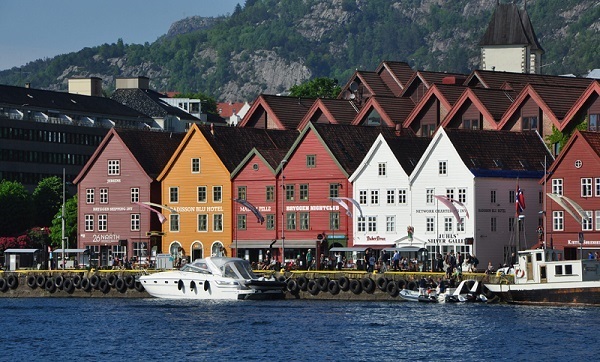 Bergen has plenty of other delights for sightseers and the usual array of eating places of all kinds. We sat outside the Egon restaurant, part of a chain, on the harbour where my wife, Shirley, enjoyed Lofoten cod with bacon, pesto and grilled lime. Less adventurous, I opted for a non-Norwegian fusili with chicken. With drinks the bill came to NOK626 (£52.00) – again, not bad by Norwegian standards. At the other end of the building is the fine-dining restaurant 1877 with prices to match its status, but it was closed on the Sunday we were there. I have also seen two branches of McDonald’s in Bergen, one in an old Norwegian wooden house near the harbour, probably the prettiest burger shop in the world.